Quality chemical solutions for over 40 years. 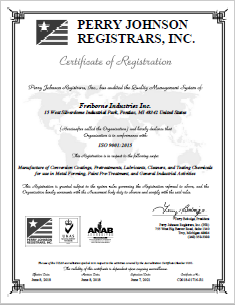 Freiborne is committed to quality in all its operations. Our ISO9001:2015 driven quality plan ensures that a high level of consistency is maintained in all our manufacturing, technical service and logistical activities. Our sales personnel and, by extension, our customers enjoy the support of our dedicated and experienced R & D department in optimizing the use of Freiborne product systems. Freiborne has been providing surface chemistry solutions and service to metal-forming, paint pretreatment and general industry for more than forty years. Our sustainability is due to our ability to earn and maintain a reputation for consistently developing and manufacturing quality products and services. Our main objective is to not only manufacture and develop premier chemicals, but to ensure that our customers are 100 percent satisfied.